A. This is a common question for women who are new to the beer drinking and purchasing community. Beer is perishable just like many other food items but brewers are not required to put use by dates on the bottle. As a mother and a wife, I don’t like to keep things for very long in my fridge or my cupboard for fear of my family becoming ill from something they might eat. We pay close attention to the labels on the food products that we by, especially the Use By Date. For many women not being able to find that date on a beer is a little unnerving. Anheuser-Bush does put a “born on” date on their bottled beer, but that date still may not help you if you do not know how long from that date the beer is good. I remember the first time I had the opportunity to see the born on date, my first thought was, “Great, and when is the “Dead by Date”. I have learned that beer is good 4-9 months on the shelf. 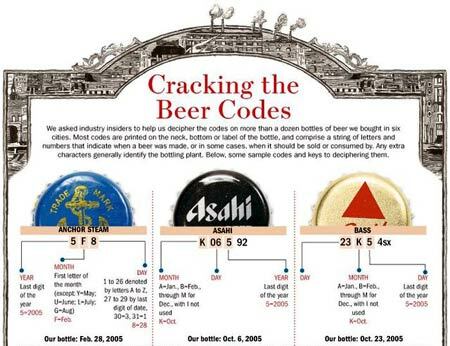 Many brewers put a code on their bottles that represent their expiration dates, it’s just in secret code. 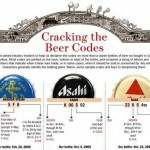 You can learn more reading this blog, The Secret Code of Beer Expiration Dates. It is not easy, and many avid beer drinkers will tell you it never sits around long enough to get stale. That may not be the case with you, in fact people give me beer as a gift quite often, and sometimes it sits for longer than I would care for it too. Brewers could do a lot to make it easier for us by putting a simple – “best if used by” date on their labels. You won’t get sick from drinking an out dated beer, but you may not enjoy the beer as much. It begins to have a dull taste or off flavor, so if it is a beer you like and it taste off, flat, papery or metallic then indeed it may be time to toss it out!